Graham: "I've Hit a Wall Here"
Despite his strong showing in the undercard round in the recent GOP candidate debate in Las Vegas, Senator Lindsey Graham elected to end his campaign for President earlier this week. Graham, who is known for his one-liners, said that he had "hit a wall" and that he was going to be suspending his campaign. The South Carolina Senator, who has served in his role since January of 2003, is well respected in the Republican party. Graham, however, just couldn't gain any momentum with Republican supporters and was unable to gain any precious face time in the main GOP debates. 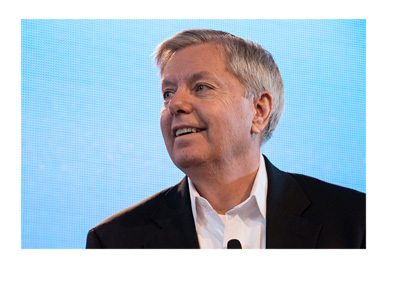 According to various polling data, Graham had the support of roughly 0.4% of Republican voters. These low numbers prevented Graham from getting onto the main Fox or CNN GOP debates, and this prevented Graham from developing any momentum. Graham surely would have performed very well in these debates, as he is known for being extremely quick with a sharp tongue. Graham has long argued that the United States needs to have more troops on the ground in both Iraq and Syria to battle ISIS. Graham has been outspoken in his desire for Donald Trump not to win the GOP nomination - in fact, Graham called Trump a "jackass" in the summer of 2015, which led to Trump famously giving out Graham's personal cell phone number during a press conference. Senator Graham hasn't said as of yet who he will end up supporting for President, though it's pretty likely not to be Donald Trump.